The Washington Capitals have recalled goaltender Vitek Vanecek from the Hershey Bears and re-assigned goaltender Ilya Samsonov to Hershey, senior vice president and general manager Brian MacLellan announced today. Vanecek stopped 31 of 32 shots he faced last night against the Bridgeport Sound Tigers, and was the first star of the game (here). Caps have swapped third goalies, sending Samsonov back to Hershey and recalling Vanecek. Nothing’s wrong with Holtby or Copley, just want to have an extra around to be safe. Vanecek, 23, has posted a record of 21-10-6 with a 2.62 goals against average and a .907 save percentage in 38 games with the Bears this season. The 6’1”, 190-pound goaltender was named to the 2019 AHL All-Star Classic Atlantic Division team and was named the CCM/AHL Player of the Week for the period ending Oct. 21. In that span, Vanecek posted a 2-0-1 record with a 1.62 goals against average and a .949 save percentage, stopping 94 of 99 shots in three road starts. The Havlickuv Brod, Czech Republic, native has allowed two or fewer goals in 19 games this season. In 110 career games with the Bears, Vanecek has a 52-33-24 record with a 2.69 goals against average, a .903 save percentage and nine shutouts. The Capitals selected Vanecek with their second round pick, 39th overall, in the 2014 NHL Draft. 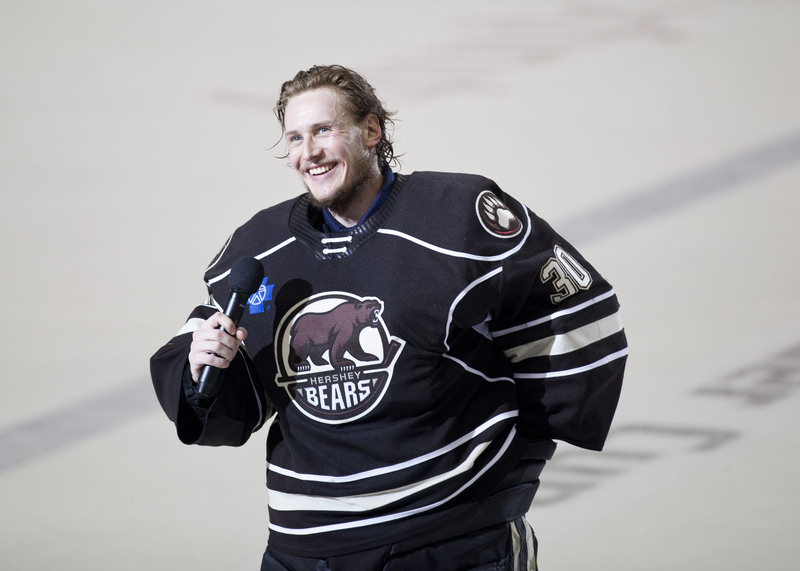 Samsonov, 22, has posted a record of 19-14-5 with a 2.74 goals against average and a .896 save percentage in 36 games with the Bears this season. The 6’2”, 205-pound goaltender has recorded three shutouts and posted a 10-0-1 record from Jan. 12 through Feb. 27. The Magnitogorsk, Russia, native recorded a 12-9-1 record with a 2.31 goals against average and a .926 save percentage in 26 regular season games and a 1-2 record with a 2.30 goals against average and a .913 save percentage in five playoff games with Metallurg Magnitogorsk in the Kontinental Hockey League (KHL) during the 2017-18 season. The Magnitogorsk, Russia, native also represented Russia in two international games, recording a 0.99 goals against average and a .956 save percentage. Washington selected Samsonov with their first round pick, 22nd overall, in the 2015 NHL Draft. Jon has been a Caps fan since day one, attending his first game at the Capital Centre in 1974. His passion for the Caps has grown over the decades, which has included time as a season ticket holder, social media and community organizer, and most recently led to the founding of NoVa Caps in 2014. Jon earned a Bachelor's of Science in Engineering at Old Dominion University, and is a Systems Engineer during intermissions, which has been instrumental in supporting his Capitals habit. This entry was posted in News and tagged Ilya Samsonov, Vitek Vanecek. Bookmark the permalink.